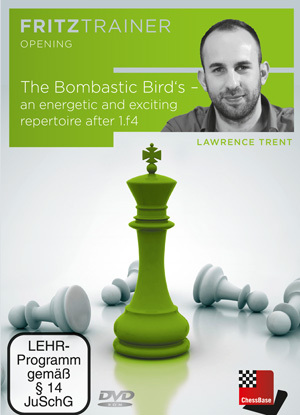 The well known Lawrence Trent provides the user of this DVD with two heavy download files on the good old Bird’s opening named after the famous English Master H.E.Bird who demonstrated as no other the aggressive potential of this opening in the second half of the nineteenth century. Players as Nimzowitsch won several beautiful games with it and nowadays it is even taken up by word champions as wonder boy Magnus Carlsen! A lot of attention from Trent goes to modern lines as the Bird Leningrad that runs with the moves 1.f4 d5 2.Nf3 Nf6 3.g3 g6 4.Bg2 Bg7 5.0-0 0-0 6.d3 c5 7.c3 Nc6 8.Na3 b6 but players as Adams and Carlsen prefer here the set-up with the rook. Included on this DVD are razor sharp lines from the Froms Gambit,established theory’s assessment of unclear comes for us as no suprice. 1.f4 e5 2.fxe5 Nc6 3.Nf3 g5 4.d4 g4 5.Ng5 d6 6.e4 h6 7.Nxf7 Kxf7 8.Bc4+ Kg7 9.e6 Nf6 10.0-0 Na5 11.Bd3 Bxe6 12.d5 Nc6 13.dxe6 Ne5 14.Nc3 c6 15.Ne2 Qe8 16.Nd4 c5 17.Nf5+ Kg6 18.Nh4+ Kg7 19.Bc4 Nxc4 20.Rxf6 Kxf6 21.Qf1+ Kxe6 22.Qxc4+ Kd7 23.Bf4 Bg7 24.Nf5 Be5 25.Nxd6 Qe6 26.Qb5+ Kxd6 27.Rd1+ Ke7 28.Bxe5 Rhd8 29.Qxb7+ Ke8 30.Rf1 Rac8 31.Qg7 Qe7 32.Qg6+ 1-0,running time is a impressive 6 hours and 21 minutes. Included are selftests plus a Hugh model file from over 140 entries! Conclusion: Very important reference DVD on the Bird! 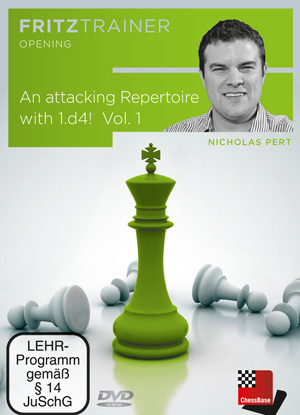 Grandmaster Nicholas Pert comes with two smashing repertoire made attacking DVD’s based on the moves 1.d4 d5.2.c4 plus all kind of alternatives besides the deeply covered Queen’s Gambit Accepted and Declined. And that includes lines as Tarrasch,Slav,Schara Henning Gambit,Triangle setup,Symmetrical,Baltic,Chigorin,Albin Counter Gambit and more. 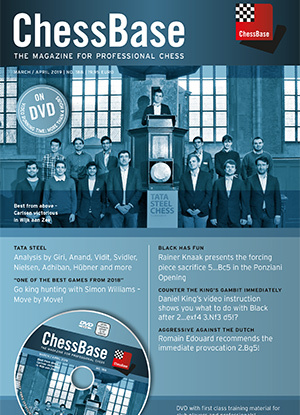 The second DVD holds lines as Blumenfeld Gambit,Nimzo-Indian,Benoni setups,Benko Gambit,Blumenfeld,Budapest etc. Both DVD have impressive download files and offer both together over 12 hour video entertainment. Included are exercises and extra databases with around 200 entries,but please note that the Grunfeld and Kings Indian variations (2...g6) are not covered here. 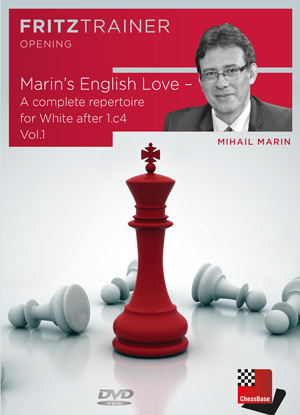 Grandmaster Mihail Marin provides the user of these two DVD’s with a perfect made life time repertoire opening based on the move 1.c4, the so called English Opening, and it derives it name from the unofficial English world champion Howard Staunton. Even the legendary Bobby Fischer used it once as suprice weapon. it does not matter what black plays Marin comes with the perfect timeless grandmaster answer. For the start there are six installation files and both DVD's are good for over 13 hours highly interesting video entertainment. and part two goes for answers as 1...c5, 1...c6 and 1...e6. Besides the excellent video analyses there are uncountable text explanations, so as for example the Double Fianchetto versus King's Indian. Included are files with hundreds of interesting model games where many of them are more than excellent analysed. The index of these DVD's are good for nearly 98 different and well covered variations! Conclusion: Seldom I have such excellent made DVD’s! 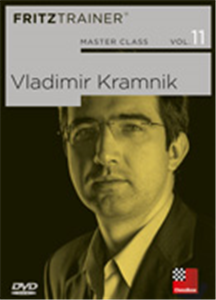 A Kramnik Powerbook: The opening repertoire of the 14th world champion as a variation tree. There was a time that chess professionals have to carry a bag of heavy loaded chess magazines with them to keep abreast of latest developments, but in our computer chess age we only have to buy a simple ChessBase Magazine and with one mouse click the user has access to a Hugh amount of latest chess developments. For example this super made ChessBase Magazine holds all the games of London Chess Classic plus all the Tata Steel games and that are all together 216 entries! And from these games a small 47 of them cover excellent annotations from players as Anish Giri,Viswanathan Anand and more! So there is a lot to learn here! The so called theory files hold wel written contributions on: Symmetrical English,Accelerated Queens Indian,Dutch,Pirc,Sveshnikov,Maroczy,French Steinitz,Bishops Opening,Petroff,Poziani,Slav and Catalan. This heavy loaded Magazine also hold excellent opening video from Daniel King on the King’s Gambit,Yannick Pelletier on the King’s Indian and Lawrence Trent on the Najdorf Variation. Other columns are Williams: Move by Move,Rogozenco :The Classic,Marin:Kingside expansion with g4-g5,Reeh:Tactics Time to be brilliant,Knaak:Recent opening traps and at last Karsten Müller excellent made Endgame contribution with Recent rook endings. The user shall find here two videos on Magnus Carlsen’s endgame with bishop + knight against rook from Wijk aan Zee and more! Included is a eye catching booklet in two languages,English and German. Conclusion:This is must have material and it offers more than any printed book or magazine!